This version of the Kitarou story is based on the original Hakaba Kitarou manga, the manga which inspired the popular Gegege no Kitarou series in the late 60's. 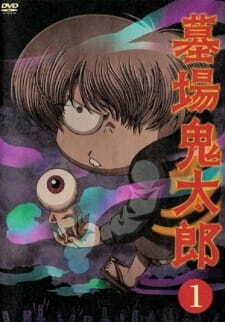 Hakaba Kitarou is the sixth adaptation of the original Hakaba Kitarou manga, which is more known as Gegege no Kitarou. It is a rather strange series that has a nice blend of comedy and horror. From the description and art, it may seem &quot;kiddie&quot;, like the other Gegege no Kitarou adaptations, but it is far from it. This series has quite a sense of humor, so those who like dark comedy may like this series. Story: Hakaba Kitarou does not actually have an overarching plot. Most of the episodes can stand on their own, and there is very little connection between what happens from the previous episode to the next one, with the exception of one or two of the episodes. The titular character, Kitarou, is the last living descendant of the Ghost Tribe, and it is basically a story of his various encounters with different supernatural beings. The story in each of the individual episodes are interesting and a bit peculiar. The only downside though is that they become repetitive after the halfway point. A few of the later stand alone episodes felt like they were following a standard formula with variations here and there. Art: The art director, Takashi Kurahashi, is the same guy who did the wonderful art direction in Mononoke. I loved it there and I loved it here. The art style fits nicely in this series and is very distinct as each of the monster designs are original and unique. The series tends to use dark, gloomy colors, which nicely sets up the atmosphere, but when it uses brighter colors, it makes those colors more vibrant. This series also uses a lot of camera angles so the animation may seem a bit stiff in some parts. Sound: This series uses its soundtrack effectively to set up the atmosphere and mood. And unlike a lot of anime soundtracks, where they use musical scores and pieces, this soundtrack uses a lot of sounds. One of such often heard sounds is the clucky wood-hitting-on-wood sound. They also nicely utilize ghostly, supernatural sounds. The opening is very catchy, upbeat, and different from your usual OP, as it shows panels of the manga. It has also become one of my favorites. The ending, however, could have been better and is a bit bland compared to its wonderful opening. The voice acting is also very good, though I was a bit surprised at first by how low Kitarou sounded when he first spoke. His chuckle is very creepily well done. Characters: The majority of the cast are morally ambiguous. No one is entirely good and no one is entirely bad. You first have Kitarou, who is definitely not your average goody good shoe protagonist. He does things based almost purely on his own benefits. Then you have Nezumi Otoko, also called the Rat Man, who shows some antagonistic tendencies towards Kitarou, but is not exactly one. He is rational, and like Kitarou, does things if it benefits him. The side characters also show various shades of gray. It sounds as if I'm giving a lot of praise to the characters, but it works more like a double-edged sword. Although Kitarou and Rat Man's antics are amusing, I found myself not really caring for them for the most part. I should also warn that this series tends to kill off its character with little to no regard, so that may make it hard to feel for them. Enjoyment: I found some episodes amazing, I found exactly two of the episodes disappointing (the ones with a certain cat girl), and the others ranged from very good to decent. Many of the episodes could be hit or miss, so it basically comes down to whatever floats your boat. I enjoyed the majority of the episodes, save for the two that I thought were disappointing.